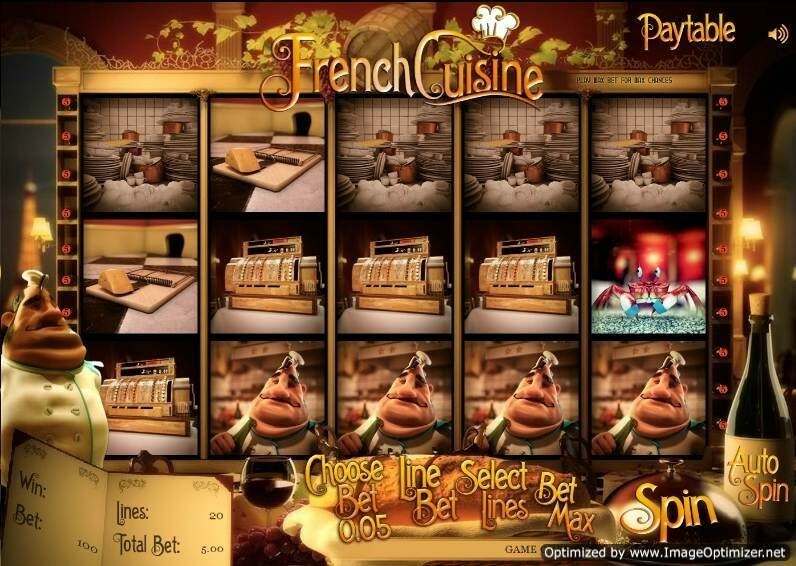 French Cuisine is a fun French eatery themed 3D video slot that has 5 reels and 20 paylines. This multi payline slot has high quality stunning 3D graphics well equipped with wine, bread and romantic music. The introduction movie clip narrates a funny story about a famous chef who handles an unusually small problem which has huge consequences. The French Cuisine video slot has over 21 different winning combinations. The majority of the reel symbols on this slot are excellent animated 3D quality and make a welcome change to the standard reel symbol design. The symbols include; the symbol with meat cuts on it, followed by the dishes, food tray, restaurant entrance, mouse trap, cash register and the chef himself. The Wild symbol is represented by the shelf with 3 mice that appears only on reel 3 and expands to fill the entire reel when activated. As like the other Rival 3D slots this French Cuisine slot also has the innovative new in-game feature named ‘Click Me’. When 3 click me symbols appear anywhere on reels 2, 3 and 4 this feature triggers. You need to click on the icons to reveal prizes. Just keep clicking until you see the ‘collect’ icon appears. The entertaining bonus feature makes the slot more interesting. During this feature players are needed to choose three courses from the menu and if the waiter delivers a dish that has not been eaten by mice already, then the player will win bonus awards. The French Cuisine slot will suit both lovers of Penny Slots and High-roller slots as the coin sizes start at $0.01 and go right up to $5 with a maximum bet - per reel spin- of a massive $500.